On my trips to the Civil Registry (central office) in Santiago de Chile this January, I went to the Index section. There you only have access to lists and lists of names PER TOWN AND YEAR. A fantastic way to trace back your ancestors. The latest clues I had *** 2 years ago *** was that Guillermo SEPULVEDA CASTILLO was connected to a small town called Los Sauces, near Angol. 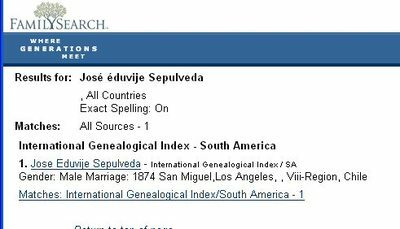 Hence there we go, browsing for all the SEPULVEDAs and CASTILLOs in the index of Los Sauces, for years 1880-1910 approximately (in case you find a death certificate, a wedding certificate, a birth certificate). 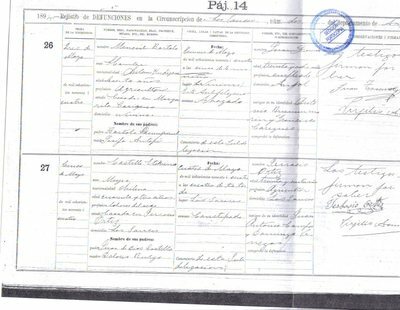 And there I found only ONE death certificate for Etelvina CASTILLO, daughter of Juan de Dios CASTILLO and Dolores BURGO(S?). Maybe the one ? 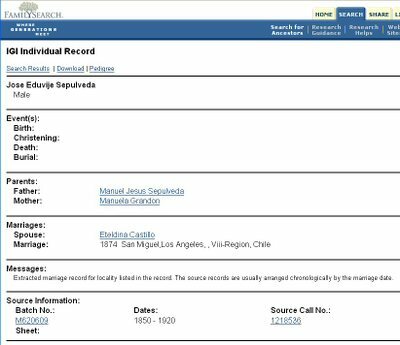 So here a few months later, I'm with both death certificates (where the parents are mentionned, they do not appear in the indexes...); Eduvijes and Etelvina were married to other people. Was this an outside-matrimony affair ? or were they married later ? Big problem. I would need to go back and investigate more. But as usual, a little trip to the Mormon sites might help (reminder: they DO NOT publish online all their material. You have to go to a temple, takes 2 months to order a microfilm, only 1 or 2 at the time... You'd better have patience). 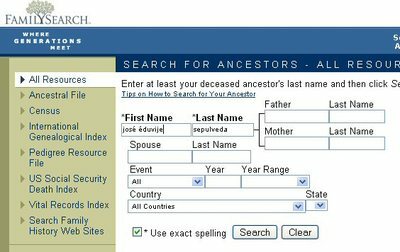 "José Eduvije" + "SEPULVEDA" + "exact spelling". And total surprise, I've found the couple, married a couple of years later, with a typo in the spelling of her. Hurray ! I'll need to find the original of this wedding certificate now. Also start taking to churches now (since we are passed Civil Registry creation dates) for original death certificates of the parents, their wedding certificates, and birth certificates of parents and kids. Santiago de Chile is one of the best cities in the world. If you are thinking of visiting there, I strongly recommend you to visit santiago-de-chile.com in order to get some pre-travel information so that you don't miss the great places there.